Depending on whom you ask, the term Lecture Performance either provokes giddy excitement or irritated annoyance. For the last decade or so, ›Lecture Performance‹ has become one of those buzzwords haunting theory-driven art production and the discourse around it. 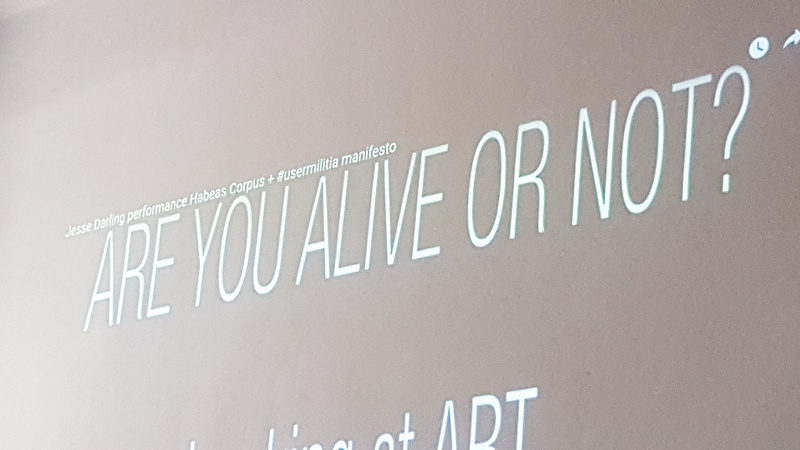 Although precursory approaches can be traced back to 60s experimental theatre and strategies of institutional critique of the 90s (some argue to go back even further and consider Aby Warburg’s Dia Lectures in the 1920s), Lecture Performance is often considered to be a very ›contemporary‹ phenomenon. We’ll discuss why that might be and furthermore try to shed light on political and aesthetic implications of artists appropriating the academic format of the ›lecture‹. Most importantly, we’ll familiarize ourselves with performative strategies by watching examples and reading texts. 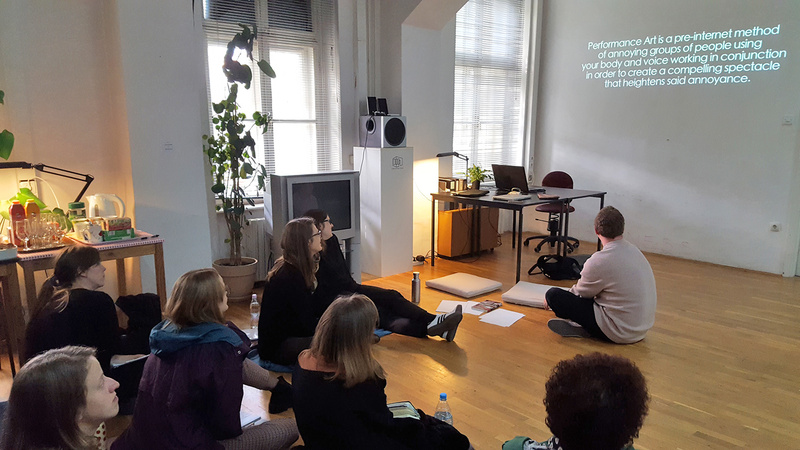 The second day of the workshop is devoted to the participants (curatorial/academic) practice and how performative strategies could be useful when faced with the omnipresent demand of having to speak in public. Participants are asked to bring a (short) text or an excerpt of their own writing and use it to stage a small performance. Whether these are done individually or collectively, use appropriated strategies or something new completely is up to the participants. 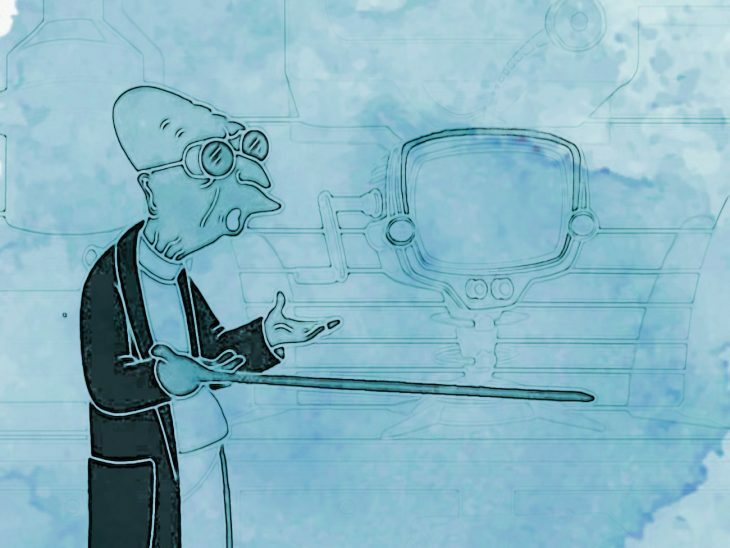 As a group we’ll try to create an atmosphere that encourages everybody to experiment comfortably. No previous performance experience is required. This workshop explicitly invites people to join, who feel shy and awkward around talking in public. Artists and writers potentially to be discussed: Grada Kilomba, Hito Steyerl, Andrea Fraser, Tom Holert, Martha Rosler, Diedrich Diederichsen, Devin Kenny, Xavier Le Roy, Pauline Boudry / Renate Lorenz, Rabih Mroué, Walid Raad, Jan Erbelding, Bruce Hainley, Ulf Aminde, JT LeRoy, Dan Graham, Coco Fusco, Spalding Gray, Juliette Blightman, Hans Haake, Rhonda Liebermann, Jan Verwoert, Sturtevant, Discoteca Flaming Star. Max Grau (1988) studied Fine Arts in Saarbrücken, Berlin and Los Angeles. His work uses a variety of media such as video, text, email, performance, photography, drawing, sound and printed matter. 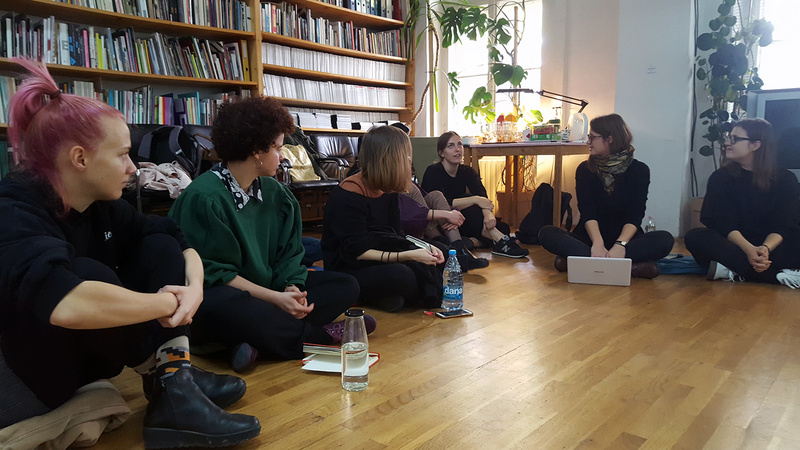 Since 2016, he has been involved in *foundationClass, an educational project located at Kunsthochschule Weissensee in Berlin that tries to support refugee artists and art students to gain access to the German art school system. His work has been shown internationally, for example at Galerie La Croix, Los Angeles, Kunstmuseum Wolfsburg, Galerie Lily Robert, Paris, Pet Projects, Perth and Digital Art Centre, Taipei. His first book ›You See I’ve Always Wanted Things To Be Beautiful‹ was published by Hammann von Mier & Ruine München in February 2018. 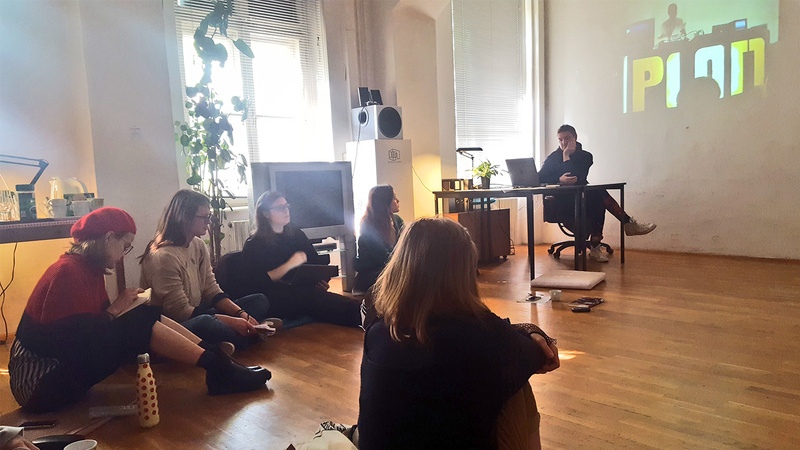 Workshop is organized by World of Art in collaboration with Goethe-Institut Slowenien. 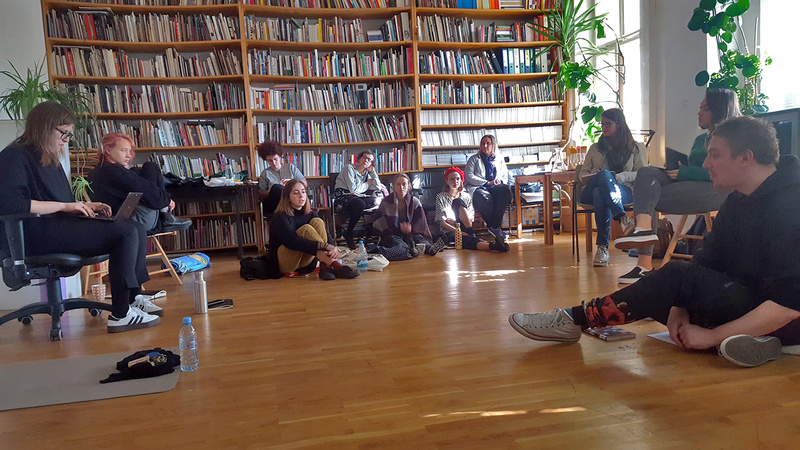 Workshop is supported by City of Ljubljana – Department for Culture and Zaklada Kultura nova. Artist residency facilitated by the Public Fund for Cultural Activities.